She was born in Canterbury, or maybe Cologne, in 1634 or 1639 or perhaps even as late as 1642. Whoever she was and wherever she came from, Mary was a fascinating individual who captured the interests of many, including the famed diarist Pepys. She convinced many Londoners that she was a wealthy and well-educated German princess but other contemporaries claimed Mary was actually the runaway wife of a Canterbury shoemaker who fled to Barbados seeking to escape her husband before taking up with three other men, the last of whom, John Carleton, prosecuted her for bigamy at the Old Bailey in 1663. When Mary was acquitted, she took lovers, changed identities and supported herself through tricks and thievery. Convicted of theft in 1670, she was transported to Jamaica but engineered her return to England where she was caught again, and recognized. Confessing all, Mary was taken to the gallows at Tyburn and executed in January of 1673. Too often we assume that our modern age of celebrity culture is unique in fixating on the bad boys and girls of the day. But Mary Moders, as she was born in Canterbury, fascinated her contemporaries to the extent that she spawned two remarkable flurries of publications decrying her perfidy or defending her honour. Some scholars have claimed that her defensive memoirs, An Historical Narrative of the German Princess and particularly The Case of Madam Mary Carleton, were so learned and well-written that they must have been authored by someone else, i.e. a man. Other academics and even Mary’s most skeptical contemporaries believed these were her own words. Those who doubted Mary’s truthfulness but not her authorship pointed to Mary’s facility with words, her practice at forging identity documents and her skill at appearing part of the highest ranks of society: this was no empty foil but a full-out confidence artist. In her long and varied career, Mary was also a bigamist several times over: she left her first husband after the death of two children, marrying a doctor who aided her in her escape before abandoning him and taking up with a bricklayer. After she travelled to London in the guise of a rich continental woman, she drew the attention of the Carleton family and was courted by young John Carleton, an ambitious lawyer’s clerk. The two of them must have been a disappointment to each other in terms of riches and opportunities. The Carletons, tipped off to Mary’s true past, attempted to prosecute her for bigamy. A 1604 legislative change, “An Act to restrain all persons from marrying until their former wives and former husbands be dead” (I Jac I, c. 11) had taken what was formerly a spiritual offense punishable by penance and transformed it into a felony crime. Mary could have been executed for her disregard of the solemnity of marriage as other contemporaries were. However, the Carletons failed to document Mary’s bigamous past. They produced few witnesses who could testify to her previous life in Canterbury and the case was overthrown. Instead of a humbled convict, Mary became a darling of fashionable London. She was visited by gawkers while still in custody and may well have used the experience to find new ways to exploit her new-found fame to extract gifts and confidences from those who rose to her defence. Given her later convictions for theft of silver plate and the heady riches she accumulated through fraud, Mary appears to have been always on the make. And yet, how much can we really know of what she did and what she desired? As her best biographer, Frances Kirkman, author of The Counterfeit Lady pictured above, wrote of her in 1673: “How can Truth be discovered of her who was wholly composed of Falsehood?” For the intriguing story of a woman who shed the conventional life and embraced an early form of celebrity culture in a life of scandal and adventure, look no farther than the bigamous thief, Mary Carleton. Susan Brown, Patricia Clements, and Isobel Grundy, eds. “Mary Carleton entry: Overview screen” within Orlando: Women’s Writing in the British Isles from the Beginnings to the Present. Cambridge: Cambridge University Press Online, 2006. http://orlando.cambridge.org/public/svPeople?person_id=carlma. 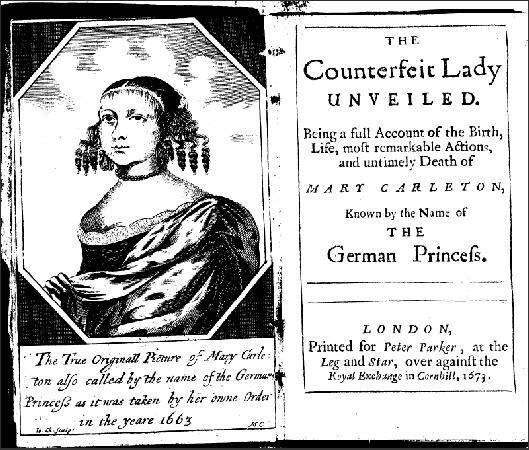 Kate Lilley, “Mary Carleton’s False Additions: The Case of the ‘German Princess'” Humanities Review 2010 https://www.academia.edu/265004/Mary_Carletons_False_Additions_the_Case_of_the_German_Princess. Janet Todd, “Carleton , Mary (1634×42–1673)”, Oxford Dictionary of National Biography, Oxford: Oxford University Press, 2004 http://www.oxforddnb.com/view/article/4676. Geraldine Wagner, “The Staged Self in Mary Carleton’s Autobiographical Narratives” CLCWeb 7:3 (September, 2005) http://docs.lib.purdue.edu/clcweb/vol7/iss3/7.